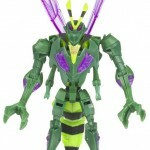 ToyArk.com has received official, high resolution images in and out of packaging for Animated Deluxe-class Samurai Prowl and Waspinator. Both figures will be introduced as part of the Animated Deluxe Wave 6 (2009 Wave 2) Assortment, which is due out in January/February. Discuss on the Toyark Forums› Views: 5787 › Credit: of the Toyark Forums!